Was Beto The One Who Threw The ‘Lame Party’ When Trump Rallied In His Backyard? Well, it didn’t happen. 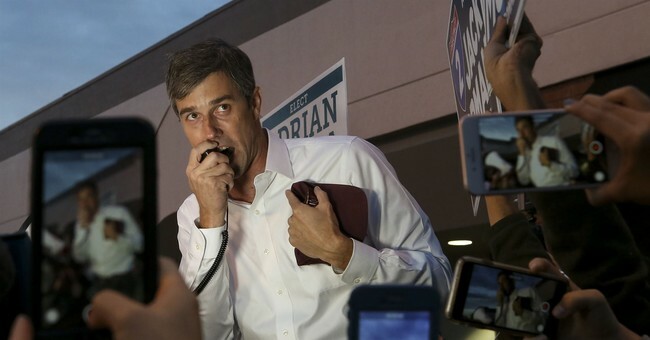 Former Texas Democratic Congressman Robert O’Rourke (aka “Beto”) didn’t announce his 2020 presidential ambitions, though many expect him to do so. He did, however, hold an event during President Trump’s rally. It was the battle of the rallies, which means the media was going to be looking for who had better attendance. Trump is the president of the United States. Bob has local name recognition being that this is his former congressional district. It was your run-of-the-mill Trump speech, with the president touting his accomplishments, trashing his enemies, and being a cheerleader for the country since Democrats have devolved into trashing America and wanting to destroy its vibrant economy through this Green New Deal. So, how many people did show up? Trump claimed that O'Rourke had only drawn 200 or 300 to his protest while they had 35,000 people trying to get into his. "He's supposed to win in order to run," the president jabbed. "Beto was defeated," Trump said referring to the race against Cruz, as the president boasted of his own undefeated record in his first bid for elective office. According to NBC News, O'Rourke's team said there were about 7,000 people at his rallyand mile-long march beforehand, per law enforcement. And Bloomberg News reported that O'Rourke's rally had been estimated at 10,000 to 15,000, according to local police. At various points during his own rally, Trump claimed that 69,000 people had RSVP'd and that fire marshals allowed 10,000 people in with "tens of thousands" still watching outside. But NBC News reported that Trump's rally was at its 6,500 capacity with 10,000 to 12,000 watching outsideor in overflow areas, per the local police and fire departments. In the grand scheme of things, these numbers really don’t matter. They’re looked into because Trump made the claims about the attendance, the media hates Trump, and they will do anything to discredit him. So, expect some more coverage about the dueling rallies and the crowd sizes, but it would appear Trump’s rally was better attended, as anyone would expect, and that Bob’s was very low energy.